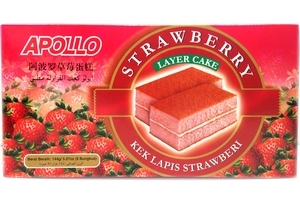 Apollo Twins Layer Cake Strawberry Flavor (Bolu Lapis Rasa Strawberi) in 5.07oz (144g) box. Product of Malaysia. Halal Certified حلال . sugar, wheat flour, eggs, vegetable fat (palm oil), vegetable oil (palm oil), glucose syrup, refined glycerine, strawberry paste, emulsifer (distilled monoglyceride e471, polyglycerol ester e475), coconut powder, sorbitol, artificial flavor (strawberry), salt, citric acid, sodium bicarbonate, potassium sorbate, calcium propionate, baking powder, synthetic food color allura red ac 160356 (e129)/(fd & c red 40).